When your senior loved one experiences an illness or injury that sends them to the hospital, life changes quickly. Their bones and bodies take longer to heal than they once did and that means that even after they have been released from the hospital, the healing process most likely won’t be complete. 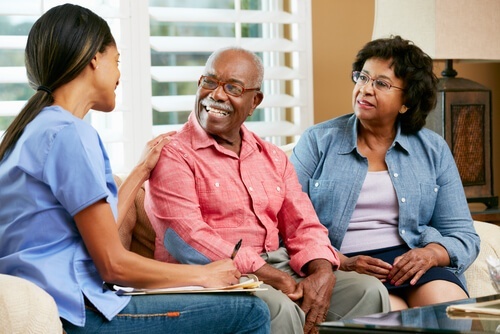 In many cases, the doctor will recommend that seniors stay in a rehabilitation facility to provide physical therapy and continue the healing process, but even then your loved one may not be fully healed at the end of the rehabilitation. That’s when you’ll be faced with a decision: what is the best way to give your mom or dad the care they need? After some kinds of illness or injury, your family member may regain full health and mobility. In other cases, there will be long-lasting effects that may mean a loss of some level of independence. Caring for your loved one in these circumstances can be difficult, especially when you’re talking about whether or not your loved one can return to living at home alone. In either case, however, there will most likely be a period of time when additional care is needed. Encourage activity. Activity often aids recovery. Of course, you should follow the doctor’s recommendations for activity carefully, but encourage your loved one to resume things like personal care, mobility, and daily routines as much as possible within those guidelines. You may also need to make changes to the home environment to make getting around easier. Accompany your loved one to doctor’s appointments. Go with your mom or dad to each follow-up appointment so you can hear the doctor’s comments and recommendations first-hand. This is the best way to ensure that you are providing the right care. Monitor food intake carefully. There may be many reasons your loved one isn’t eating enough food. These include medication side effects like nausea or loss of appetite, resistance to new dietary recommendations, and even depression. If your mom or dad isn’t eating enough, find out why and then talk to his or her doctor about how you can help. Monitor medication carefully. It’s important that your family member takes medication as prescribed. But seniors who struggle with memory loss or who fear becoming addicted may not take medication when they need to. Some seniors will resume taking medications they were prescribed prior to hospitalization even though those prescriptions have been discontinued, help them by using medication organizers and reminding them when it’s time to take each dose. Provide companionship. One of the most frequently overlooked elements of recovering from an injury or illness is the extreme loneliness that can occur when a person is confined to the house, or even to a single room within the house. Talking to and interacting with someone on a daily basis can give seniors something to look forward to and help prevent feelings of isolation or depression. Ask for help. All of these responsibilities can quickly become overwhelming if you are the only caregiver. Don’t be afraid to ask for help when you need it whether it’s from other family members or from a professional caregiver. If your loved one has an incision that needs to be checked, dressings that need to be changed, or other medical needs such as injections or monitoring of vital signs, you may need the help of a licensed nurse. Talk to your mom or dad’s doctor about how to provide appropriate wound care or other medical care following rehabilitation. When you are the primary caregiver, there are times you need to take a break to regain your energy or take care of other responsibilities. Respite care is there to step in and help out when you need professional, compassionate care for your family member. Post-rehab care can be more labor intensive than you realize, especially if your mom or dad is facing reduced mobility for a long period of time. Home care is an excellent solution for helping your senior loved one maintain independence in their own home while also ensuring that they are healthy and safe. If you have questions about how your family can pay for home care, download our FREE Guide.